Military Situation In Deir Ezzor Countryside On October 24, 2017 (Syria Map Update) 4.8666666666667 out of 5 based on 15 ratings. 15 user reviews. This map provides a general look at the military situation in the countryside of the Syrian city of Deir Ezzor on October 24. Government forces are consolidating their gains near the city of al-Mayadin while an intense fighting is ongoing between them and ISIS members inside the city of Deir Ezzor. Euphrates’ banks are the only arable lands in central/eastern Syria and therefore a valuable source. They’re also much needed for the protection of DeZ-BuKamal highway. And who should the attacks come from??? From anyone who doesn’t want a secure highway between Syria and Iraq, isn’t that obvious? 1- Damascus-Baghdad which goes through Al-Tanaf, currently blocked by the US and Norwegian camp. 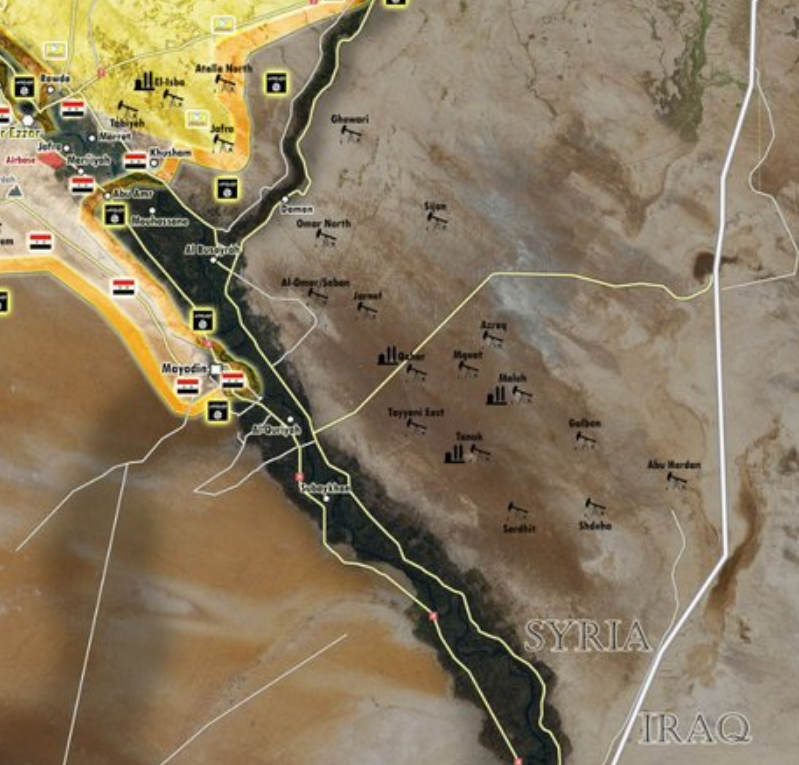 2- DeZ-Baghdad which goes through Bu-Kamal/Qa’im, currently not so safe due to ISIS presence. 3- Nusaybin (Qamishli)-Mosul goes through Rabi’a, currently controlled by PKK on Syrian side and recently recaptured by federal government on Iraqi side. Number 3 can be the most accessible one for the moment. Fortunately road number two became under Iraqi control recently which means using it will be more difficult for PKK and terrorists arms supply by the good ol’ US of A. 1) Thats rubbish. When The ISIS passage isnt existing, there will be no Al Tanf. Why should there be. I dont see that. US will go back to its or two minibases in Jordan, and we wil have the usual incidents Israel- Hebollah(+Syria). Israle wont be helped by that base. If they are helped its by be better armed by US. 2) What are they doing right now -SAA as well as SDF and Iran. Well downaeizing ISIS. 3) You assume in the most strange way, that The Federacy – if it come through – can block the rest of Syria, but we hear here all the time, that they cant exist as a unite because they are too isolated. Wel, SDF cant exist, if their border gates are open. That says, they dont block and You dont block. Your assumtions around PKK is a lie of the worst. USA dont support PKK at all. Thats promised to Turks by the Nato treaty and has been kept too. If anything, its Turks, which are the agressive part in Syria as well as Iraq. 1. It’s a nice touch that you call whatever you don’t like as rubbish. It shows how mature you become. We (and even probably even you) know that’s not the case. The US will hold Al-Tanf at least as long as they’re sure there’s no other alternative for Syria-Iraq safe passageway. When BuKamal/Qa’im is liberated, US Al-Tanf based becomes utterly useless, but it doesn’t mean the US will leave it. They’ll use anything that can hurt the resistance. Damascus-Baghdad highway through Al-Tanf is a much better route than DeZ-Baghdad. US out of Syria is what we all hope for, well, at least most of us. 2. You probably cannot differentiate between a route and a safe route. There’s a difference and an important one. 3. I don’t assume anything, I judge based on their actions so far. A Kurdish governing entity cannot come to existence unilaterally on other people’s lands. If they push for it, it’s a recipe for endless turmoil and war. People tend not to play nice when their lands are being stolen. In that case, we shall see who will lose the most. It’s not an assumption, it’s a FACT that Syrian Kurdish groups are PKK. Their most recent genius action is glorifying their leader, Ocalan. As I said, I judge them by their actions, not my wishes. When PYD and SDF themselves say their leader is Ocalan, and the US is supporting them, denying it would be a lie, which you seem to have no problem with. Turks don’t like Kurds and vice versa, it’s a fact. Turkey doesn’t try to hide it and I think they’re right to a degree. I too wouldn’t like any group which their most heroic action is ambushing and murdering 18-19 years old conscripts and snatching children to make them into soldiers. Of course Turks aren’t innocent either. I still need to see Turkey’s aggression towards Iraq to accept that, but as I said, nobody likes land grabbers. But the only threat is from ISIS. If they are gone, who else ? I really dont get. Im aware there will be some ISIS here and there now and then, which has to be reduced, but who else ??? Be patient. I’m sure an enemy of Syria will present itself in time. One which tries so hard to please it’s master to receive US’s support. PS. Why do you need that many question marks? Some Aleppo countryside, and some of Damascus countryside is arable. I dont understad why You write that and how its related. Pls explain again. Is it about food and tranport ? I meant to reply to Garga’s comment. Yep arable, until that is, the US decides to interrupt the flow of water from the Tabqa Dam and turn it into desert! I believe it’s not possible to cut the water with just one single Tabqa dam. with a crown 60m higher than the river bed, it’s capacity is about 10-12 cubic km of water, not counting the sediments. Discharge of Euphrates before Tabqa is about 370 cubic meters/s, about 12 cubic km annually. They simply cannot cut the water flow, but certainly are able to overflow/restrict the current, as you mentioned, IF they remain in Syria unchallenged. Its income. Well shown example of the Damaskus skizzo constructions. You also call americans for oilgrabbers -So they are – communists ???? More like thieves think everybody else steal too. Those fields are not lost. More like the grabbers from Damaskus might share their income like the other oiland gas fields inSyria. Always projecting, label others with what you’re doing. The ones attempting a land and resource grab have the nerve to call the government of the country “grabber”. Is the SDF working in conjunction with the Syrian forces by sweeping one side of the river while Syria does the other side or is it instead of fighting ISIS they are merely trying to block Syria from its oil fields. First things first , ISIS , then they can be sorted out . Nope. SDF advances quickly through Isis territory by colluding with Isis and avoiding any serious fighting. They’ve been making deals with Isis to rapidly advance to Syria’s oil fields and thus deprive the Syrian army and Syria’s people of an economic resource. It will end badly for the Kurds. Karma! It has to end badly with dirty thieves. Yes, the thieves of Bagdad probatly has to share. I hope it includes the rest of the oil- and gasfields. The solution is there. Make the corruption go away. All 40 of them plus Ali Baba? I dont like thieves and only have sympathy for starving ones. Me and you probably have very different ideas about who is a thief and who is not. If you look at the map, it looks like the Syrians will continue towards a pincer movement (I think that is what it is called), i.e. cutting the 2 parts in half and then on and on again. It worked well so far for them. Same rubbish again. Now its a bad thing that triber-ISIS give up and dont defend and destroy Omar Field and others, so many people from SDF die. The real thing is, You have DEZ as a slow low priority based on second class military forces filed up with foreiners inthe frontzone. The truth is that SDF colludes and collaborates with the invaders and murderers to satisfy their greed. Most people of the world would call them traitors. I realize the truth hurts….. Of course, in your case, you wouldn’t recognize it if it bit you in the a*s! Most people in the world dont call SDF traitors at all. My Goverment and Parlament are like many others suppporters to get rid of worldspreading terror. We also by UN condem Assad Syria for treating most of its popepaltion bad as sheep and in those matters, we have long lists of killings, airstrikes, gas. no nationallity kurds, deportation and like that. We also dont see kurds has made 450.000 dead ones and most refugees comming out from Syria as well as the internal are made invaders. Its more like an ENOUGH IS ENOUGH. Whats hurt here is the many years of wasted possibilities for reforms avoiding conflicts by building a country better for all. You made that many hardheaded violent Jihadists Yourself. West didnt invent Islam.We have our own problems(too). The traitor of Syria are the people running the Governes in Damaskus. I’ll give you that ‘most’ people in the world don’t call SDF traitors (I do because that’s exactly what they are), but their Syrian countrymen surely know that that is what they are. Blaming a religion because a particular group is extremist and uses it to satisfy their greed and lust for power does not make an entire religion bad. You can find through history Christian extremists (didn’t make all Christians bad), Jewish extremists (currently called Zionists) as well as others. The Empire controls what’s allowed to pass for news in the ‘west’ using censorship and propaganda to achieve their goals in the world. Why do you think that you never hear the side of the story from the people being accused of this or that in your media? Clearly you need to do some research. Oh and it’s funny that Assad didn’t earn the title of dictator and accusations of chemical weapons usage, until he denied the US pipeline through his country; said goal to run through Turkey and then to Europe in an effort to dislodge Russian gas from Europe. As for creating terrorists; where were all these terrorists before the invasion of Iraq under false pretenses? The ‘West’ CREATED terrorism!!! It’s also funny that wherever the US seeks to target a country for it’s geopolitical gain, Isis and/or Nusra suddenly appear? Just read this morning how Isis is now growing in Afghanistan…. You might have read recently that the Empire decided to concentrate on Afghanistan again. Oh and what about those years where Isis kept taking more and more land along with having those long Isis convoys through the Syrian desert under the watchful eye of the ‘coalition’. Those convoys came to an end when a country (Russia) that desired to rid the region of the scourge of terrorism began actively targeting them. You seriously need to do some research. Oh and by the way, maybe you haven’t heard yet, but youtube, google and facebook are now actively censoring what you see so that you form the RIGHT opinion. The real thing is that ISIS from day one have been a vital part of the illegal US/ISIS/SDF/Kurdish anti-Syrian government terror coalition which invaded and occupied Syrian sovereign land and is stealing Syria’s vital natural resources from the mouth of the Syrian people to overfeed instead the fat bellies of the multi-billionaire Western corporate criminal mafia with the excuse of the Kurdish foreign settlers and thieves. Hahahah. SDF is only 2 years old and ISIS has made almost all the close to 3 mio refugees before the Kobani turn around. You are barking mad. Dont You have a calender. No, he’s right. SDF’s day one may be just 2 years ago, but it’s a day one nonetheless. Land grab usually starts with changing the name of a place, in that case changing Ayn-al-Arab into Kobani. SDF and all so called Opposition have been allies of ISIS since day one – there is a lot of film about that available going back years on the Syrian Army Platforms. When ISIS first started in Syria the Leaders of the Opposition were filmed stating what great guys ISIS were and patting them on the back. There has also been film and evidence circulated widely showing ISIS being evacuated from Raqqa and surrounding areas by the coachload, forewarned by the USA while the USA so called Coalition bombed Infrastructure. There is a facebook Page named “Raqqa is silently bleeding” and for years they used to be a great source of these films along with Youtube and film and facebook blatantly posted by the Syrian Opposition. 100% of members of ISIS from Iran are Sunni Kurds. And they have liaised with ISIS Oil from day one. The battle for Kurdish land between Kurds and ISIS has always been a charade STAGED fro the benefit of Western Propaganda. The US has always been after Re Building contracts. Seemes like crap continue and You in the region dont solve anything and others outside think its a good idea to come in wirth weapons and kill faster. At Raqqa You forget, that 1100 are dead of the civilians and 450.000 are saved.2000 from SDF has been killed there. Correct the price for the hotages was 275 from ISIS went away. Kurds were nothing until ISIS came out of hands from Assads and later on USA as well. Totally upside down some sekular Marxist should work with Johadists of the worst kind, which made 2 mio. refugees from the possestion, they have retaken now. How is it possible to come with that dirt. You just cover the low priority for Assdas to take this part back and Your army is ineffective and slow having no idea about what they met i DEZ as well as secured and good supplylines for it. You blame SDF You are bad . You should be happy SDF kill ISIS too and do it well. I only see hostile reactions. Damaskus blamed SDF they didnt help at DEZ. When they came they were airstrike and oilgrabbers. I cant see any blockings by SDFs since You began to make that kind of exuse accusing Your own population. No wonder so many in Syria dont want You. stop apologizing for the thieving, invading, usurping Kurds and the CIA/deep-State/NATO/Saudi-Wahabi/Zionist criminal cabal that has destroyed a string of independent countries which went against the international zionist mafia banksters, the petro-dollar and US hegemony, i,e, the New World Order!!!! This invasion of Syria, like the one in Libya, was plotted, decades ago, by this criminal cabal. What made these invasion even more despicable than the ones on Yugoslavia and Iraq, was the use of islamist terrorists to do the dirty work!!!! Ask yourself, you diluted brainwashed sheep, why hasn’t the USA, under Bush, Obama,or Trump, gone after the Saudi monarchy for financing the 9-11 hijackers??? It is all there on those 28 pages of the Congressional 9-11 investigation report that Bush and Obama kept away from the public for nearly 16 years!!!! Why has not Trump bomb the House of Saud after he, correctly, said, many times in his campaign, and before that, that to defeat islamist terrorism, you need to go after Saudi Arabia, the main sponsor of Wahhabism and islamist terrorism worldwide!!!! Instead, he is selling them $100s of billions in weapons so that they can continue arming islamist terrorists and massacring Yemenis!!!! Why did Bush allowed all the Saudi Royals and diplomats to get on planes and escape from the USA, after 9-11, when all air ports were locked-down with warnings to shoot down any planes that took off!!!!??? There is an evil USA-Wahhabi-Zionist pact, 9-11 was and inside job between the Bush cabinet, the Saudi wahhabi terrorism inc, and the zionist mossad demolition team that brought down the towers, including WTC building #3 which wasn’t hit by any plane!!!! ISIS was obama’s CIA’s plan B after obama backed down from his red line on the sand when the Russians stepped in. ISIS is the creation of the CIA, organized and trained by US and israeli mercenaries, financed by the Saudis and other Gulf wahhabi monarchies!!! The Kurds, once more, are the tools of CIA/Zionist schemes to control Middle east oil and politics!!!! Get it through your thick head the US government, and NATO, is controlled by evil, behind the scenes, masters, like the Rothschilds!!! US presidents are but mere puppets who do their bidding!!! ABORTION RIGHTS ON THE EUPHRATES!!!!!!!! it seems that the Kurds have left a buffer zone for the SAA to advance at the other side of the river…..
No, they have made no bufferzone at all. Its a matter of priority taking the ground at the higher levels first. Apart from the oilfields the valleys below can be defended easier because of the many buildings. Im not them, but I think we will see the same systemas we see now. They make long pockets and cut them in poieces and cut them in smaller pieces. I hope they give up. Upstairs at the oilfields the triber-ISIS have. Why is Russia/SAA stuck across the Euphrates and not driving east, while the US/Kurds are moving? Ok, I heard about US and ISIS collusion, but why is the other side stuck in one place? Syria has lost already Omar oil fields, in incredible way ! SAA had the opportunity to stop SDF after taken Deir Ezzor and did nothing. SAA had another opportunity when Al Mayedin was taken and did nothing again. This oil will allow kurds (USA-Israel puppets) to construct a country by themselves, and Israel will have a rich region of oil to invest and feed its industry. Will SAA and Russia attack SDF after ISIS ? not way ! USA-Israel are behind SDF, and Russia do not want a WWIII with these animals. The Omar fields’ out put is not enough to support a single city (7,500 b/d before the war). Having them would better than not having them, I agree, but it’s not something you can build a country on. The real prize was Kirkuk (+1,000,000 b/d) which fortunately is restored to the rightful owner. It is true, Omar oilfield is not a true strategic objective (and Kirkuk was) and it will be better to negotiate about it afterwards. I’m also assuming that it will take some time to bring the production to the higher levels. I’m sure that the government wants to capture the Omar and other oil fields east of the river undamaged if they can. That’s probably why they’re holding off for now with moving the front lines through them until they’re in a stronger position. And can get the issue resolved with minimal damage. Wow, a real long term plan then! 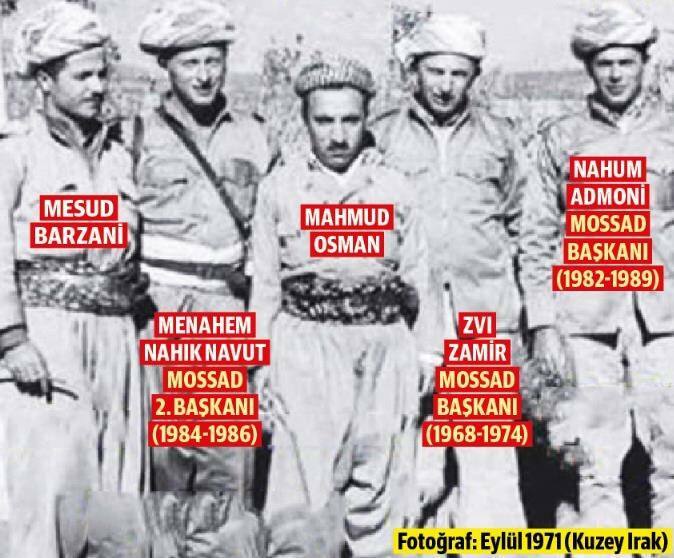 What does the word “Baskani” mean under the Mossad agents?